One of the leading Oriental Talmudists and rabbis of his day; born toward the end of the sixteenth century. Descended from a family of German scholars, he was probably born in Palestine. The greater part of his life was spent in Egypt, where he received his Talmudic education from David b. Solomon Ibn Abi Zimra and Israel de Curial. During the lifetime of his teachers, Ashkenazi was regarded as one of the highest authorities in the Orient, and he counted among his pupils such men as Isaac Luria and Solomon Adeni. The reputation of Ashkenazi in Egypt was so great that he could take it upon himself to abrogate the dignity of the nagid, which had existed for centuries and had gradually deteriorated into an arbitrary aristocratic privilege. When, in 1587, a dispute occurred in Jerusalem over the point whether scholars not engaged in business should contribute to the taxes paid by the Jewish community to the pasha, and to what extent, Ashkenazi, together with several other rabbis, took the stand that Jewish scholars, being usually impelled by love alone to emigrate to Palestine, and being scarcely able to support themselves, should be relieved from all taxes. In the same year, Ashkenazi himself traveled to Palestine and settled in Jerusalem, where he was recognized as their chief by both the Sephardim and the Ashkenazim. The conditions in Jerusalem were at this time very critical; and it was mainly due to Ashkenazi's influence that the congregations of the city were not dissolved. The German Jews, who ordinarily did not recognize the jurisdiction of the Sephardim, and who, being largely scholars, refused to pay the Jews' tax, nevertheless bowed to Ashkenazi's authority. 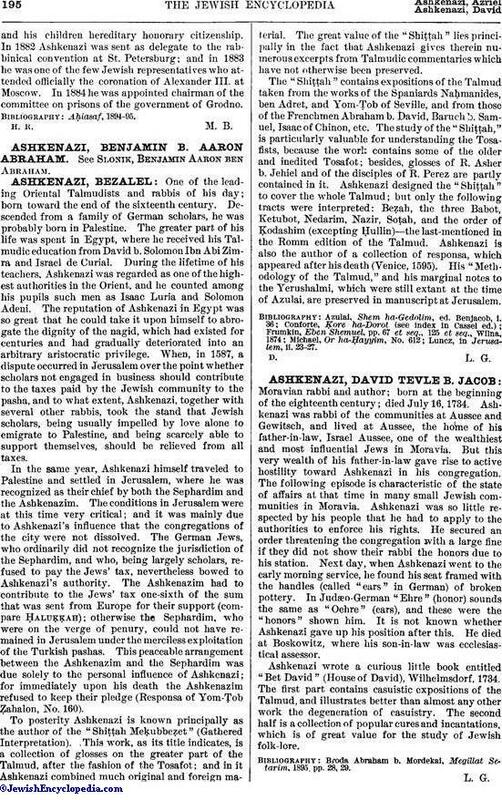 The Ashkenazim had to contribute to the Jews' tax one-sixth of the sum that was sent from Europe for their support (compare Ḥaluḳḳah); otherwise the Sephardim, who were on the verge of penury, could not have remained in Jerusalem under the merciless exploitation of the Turkish pashas. This peaceable arrangement between the Ashkenazim and the Sephardim was due solely to the personal influence of Ashkenazi; for immediately upon his death the Ashkenazim refused to keep their pledge (Responsa of Yom-Ṭob Ẓahalon, No. 160). To posterity Ashkenazi is known principally as the author of the "Shiṭṭah Meḳubbeẓet" (Gathered Interpretation). This work, as its title indicates, is a collection of glosses on the greater part of the Talmud, after the fashion of the Tosafot; and in it Ashkenazi combined much original and foreign material. The great value of the "Shiṭṭah" lies principally in the fact that Ashkenazi gives therein numerous excerpts from Talmudic commentaries which have not otherwise been preserved. The "Shiṭṭah" contains expositions of the Talmud taken from the works of the Spaniards NaḦmanides, ben Adret, and Yom-Ṭob of Seville, and from those of the Frenchmen Abraham b. David, Baruch b. Samuel, Isaac of Chinon, etc. The study of the "Shiṭṭah," is particularly valuable for understanding the Tosafists, because the work contains some of the older and inedited Tosafot; besides, glosses of R. Asher b. Jehiel and of the disciples of R. Perez are partly contained in it. Ashkenazi designed the "Shiṭṭah" to cover the whole Talmud; but only the following tracts were interpreted: Beẓah, the three Babot, Ketubot, Nedarim, Nazir, Soṭah, and the order of Ḳodashim (excepting Ḥullin)—the last-mentioned in the Romm edition of the Talmud. Ashkenazi is also the author of a collection of responsa, which appeared after his death (Venice, 1595). His "Methodology of the Talmud," and his marginal notes to the Yerushalmi, which were still extant at the time of Azulai, are preserved in manuscript at Jerusalem. Luncz, in Jerusalem, ii. 23-27.